Giufà is a small bookshop in the heart of the San Lorenzo neighborhood. The first time I went in, my eyes were captured by the black and white ground, by the red shelves full of books and by a bar, set at the end of this small ambient space. This independent bookshop, born in 2005, focuses its offers most of all on graphic novels and comics for all the ages, but it also has a good variety of national and international contemporary narratives. In both cases, you can find some good examples of small Italian publishers and new writers that can give you an overview on contemporary Italian culture. Moreover sometimes they organize small conferences and meetings about new books and interesting authors. 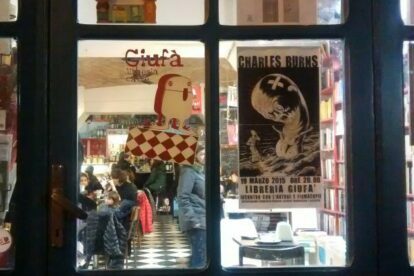 By the way, Giufà is not only a bookshop, it is also a cafè, a place to have a drink and meet a friend. They have a small, but very good and typical variety of drinks and food and, for those interested in the topic like I am, they are really vegan friendly.